Indication for Pericardiocentesis: A pericardial effusion causing tamponade (RV free wall collapse during diastole). Pathophysiology: The amount of fluid increases within the pericardial sac resulting in an increase in intrapericardial pressure. This intrapericardial pressure can rise to a level greater than the normal filling pressures of the right atrium and ventricle resulting in the restriction of ventricular filling. If the fluid accumulation within the pericardium occurs slowly, the fibrocollagenous tissue of the pericardium will expand slowly. This allows for a slow rate of change of the intrapericardial pressure. However, if there is a fast accumulation of fluid within the space, the pericardial tissue will not be as compliant resulting in larger changes in intrapericardial pressure and tamponade. As little as 150-200mL of fluid can cause tamponade if the filling occurs quickly. Signs/Symptoms: Patients may present with non-specific complaints, such as, dyspnea and exercise intolerance. On exam, the patient may be tachycardic, hypotensive (with a narrow pulse pressure), and may have pulsus paradoxus (>10mmHg decrease in systolic pressure during inspiration). Patients may also present with Beck’s Triad (distended neck veins, muffled heart tones, hypotension). Subxiphoid (SX) Axis View with Small Pericardial Effusion: A SX view of the heart visualizing the liver at the top of the screen, the right ventricle (RV) as the most anterior chamber, the left ventricle, the left atrium and the right atrium. There is a small anechoic appearing pericardial effusion seen between the liver and the inferior part of the right ventricle at the top of the screen. Plethoric IVC that lacks respiratory variation. 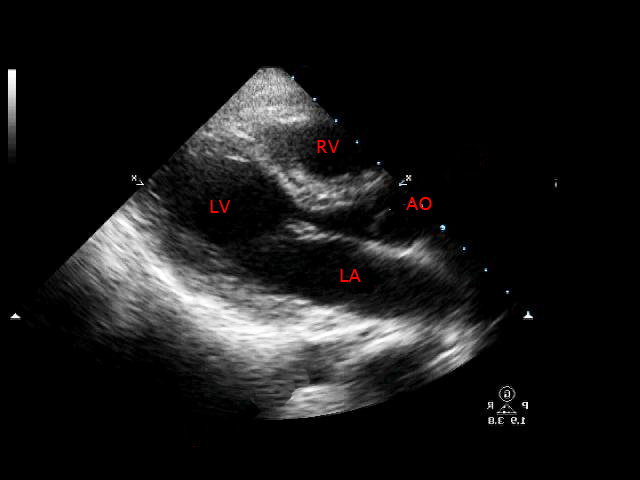 Parasternal Long (PSL) Axis View with Tamponade : A PSL axis view of the heart visualizing the left atrium, the mitral valve, the left ventricle, the aortic outflow tract, and the right ventricle at the top of the screen. A large pericardial effusion causing tamponade is seen as an anechoic black area surrounding the heart causing RV free wall collapse (seen at the top of the screen). Apical-4 Chamber (A4C) View with Tamponade: An A4C view of the heart visualizing the right ventricle, left ventricle, right atrium and left atrium. 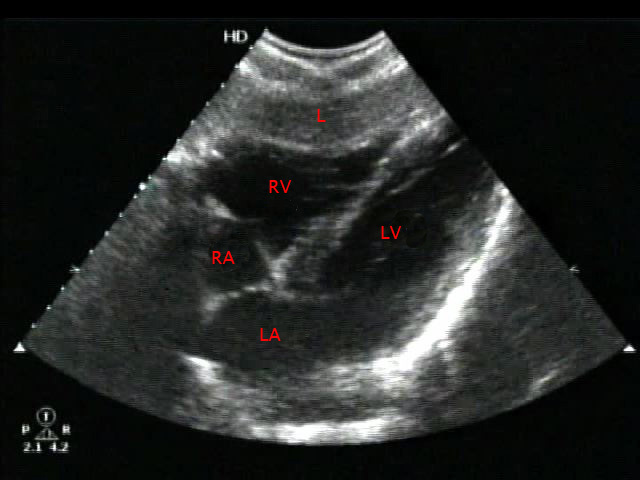 There is a large pericardial effusion causing tamponade with RV free wall collapse (seen on upper left side of image). The heart is “swinging” in the fluid, which correlates with electrical alternans on the EKG. This method may still be employed if an ultrasound machine is not available, but ultrasound-guided pericardiocentesis is the recommended safe method to perform this procedure. The pericardium lies about 2-3cm below the skin in the average adult. A 16-18 gauge needle attached to a large syringe should be used and the chest wall should be cleaned and draped using accepted sterile techniques. The needle should be inserted at the xiphoid process up into the chest at a 45° angle and directed towards the tip of the left scapula. The syringe should be aspirated as the needle is advanced every 1-2mm until fluid is aspirated. The operator should feel the needle penetrate through the pericardium. If immediate thoracotomy is not possible a catheter can be advanced using the Seldinger technique over a wire into the pericardial space and left in place to allow for continuous drainage. The best ultrasound views to perform a pericardiocentesis are based on patient habitus, positioning and which axis of the heart is optimally viewed Most typically, the subxiphoid (SX) or parasternal long (PSL) views are used, but sometimes, an apical-4-chamber (A4C) axis is best. The best probe for adequate penetration and views is a low frequency phased array transducer, but a curvilinear one can be used if needed. The probe is placed in the subxiphoid area angled up into the chest using the liver as a window. The most inferior part of the right ventricle will be struck by the sound beam first as it leaves the probe and will appear at the top of the screen on the monitor. A normal SX view will show the right ventricle (RV) up against the liver (L), left ventricle (LV), left atrium (LA) and right atrium (RA) (see fig 1). Pericardial effusion will be seen as a black anechoic area above the right ventricle and this should be where the needle should enter the pericardium. This distance can be measured in between the place where the needle will be inserted and the pericardial effusion by using the measurement markers on the monitor screen. The needle should be inserted parallel to the probe and directed at a 45° angle towards the left scapula tip. The needle will appear on the screen as a hyperechoic structure with reverberation artifact and should be used to guide the advancement towards the pericardium. The syringe should be aspirated as the needle is advanced every 1-2mm until fluid is drawn back. The probe is placed on the chest wall in a left parasternal position at approximately the 4th intercostal space, to obtain a parasternal long axis view of the heart. The most anterior part of the right ventricle (RV) will be struck by the sound beam first as it leaves the probe and will appear at the top of the screen on the monitor. Also visualized are the left ventricle (LV), left atrium (LA) and aortic outflow (AO) tract (see Fig 2). Pericardial effusion will be seen as a black anechoic area above the right ventricle and this should be where the needle should enter the pericardium. This distance can be measured in between the chest wall and the pericardial effusion. The needle should be inserted at a 45° angle in-plane to the probe on the anterior chest wall and directed down towards the effusion. The ideal insertion site on the chest wall should be closet to the area where the effusion is largest. The parasternal approach is often preferred over the subxiphoid due to its closer proximity to the pericardial effusion and a better ability to avoid the liver and lung. Agitated saline when flushed through the syringe into the pericardial space can create a “snow-storm appearance” on ultrasound. Fluid or non-clotted blood will be aspirated from the pericardial space. Removal of 5-10mL of fluid can increase the stroke volume by as much as 25-50% and result in a dramatic increase in cardiac output and blood pressure evidenced by an improvement in the patient’s vital signs. Pericardiocentesis is indicated in unstable patients with cardiac tamponade. Ultrasound allows for real-time visualization of the effusion and the needle insertion into the pericardium. The parasternal long approach may be preferred if possible. Ultrasound decreases the risk of injury and reduces the need for more invasive surgical drainage. Tintinalli, Judith. Emergency Medicine: A Comprehensive Study Guide. McGraw-Hill. New York, 2004.